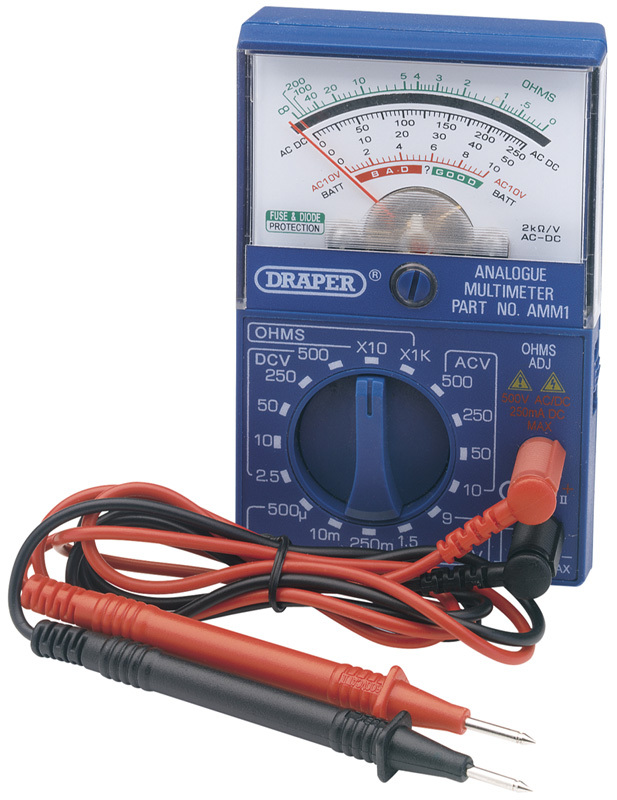 A multi-meter is one of the most versatile pieces of kit in your workshop toolbox. The question is though, how do you use it productively, and what can it tell you? Well, consider this blog a beginners guide to finding your way round the most common features of a typical digital multi-meter, We’ll look at how to make some typical measurements and how to interpret the readings. So, read on and master your multi-meter. Multi-meter basics – what is a multi-meter? A simple enough question, but worth answering in a bit of detail. For electrical system measurement applications there are a number of different aspects of a system that you may want to measure or monitor. For example, to measure the voltage of an electrical system is often of interest as this effectively shows the electrical ‘pressure’ in the system that pushes the current around (to do the work – for example, heating a bulb filament to become white hot and emit light). In addition, you may want to know the current itself, as current is effectively the amount of flow in the system – more flow, more work done. So the pressure and flow are linked, more pressure, more flow, more work done. 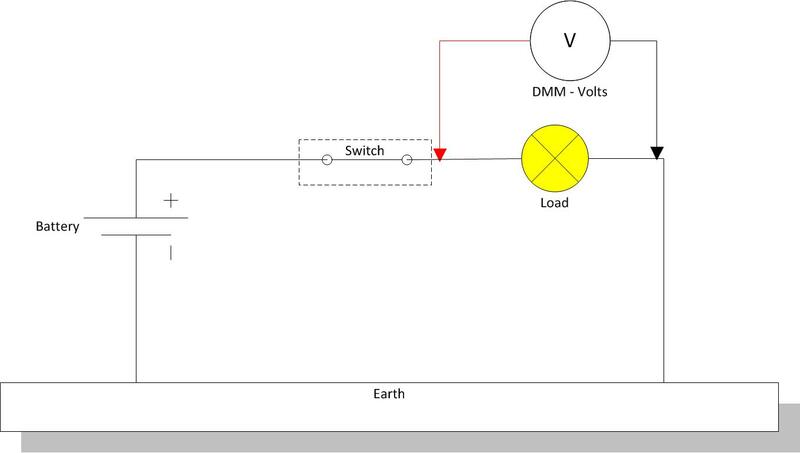 So voltage as well as current measurement is often important. But you can probably appreciate that a flow meter is a completely different measurement device and measuring principle than a pressure gauge – and it’s the same with electrical measurements – a voltmeter is a different type meter to an ammeter, or in fact, an ohm meter (measuring resistance to current flow in a part of the circuit). So you need different instruments for each – that is the beauty of a multi-meter! It’s a single meter, that is capable of measuring more than one thing in an electrical circuit – it is effectively more than a single meter, it’s several devices in one (hence the name multi). 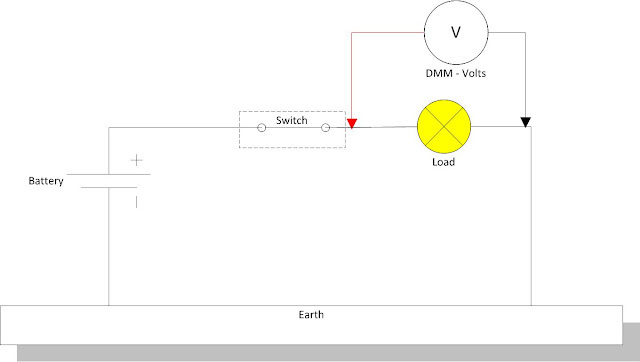 Typically, multi-meters will always be able to measure amps, voltage and ohms (resistance), but often they can incorporate other features that allow the user to do much more analysis and measurement of a circuit. Originally, multi-meters were analogue meters, with a needle and dial (like a speedometer). However, these have been almost universally superseded by the digital multi-meter, also known as a DMM. Note that analogue meters are often known as AVO’s or AVO meters (Amps-Volts-Ohms). DMM’s are much more robust than an analogue meter as they don’t need a sensitive needle/dial, however, some users prefer to look at a dial as it is easier to process visually and the detect trends (that’s why digital speedometers haven’t really caught on). 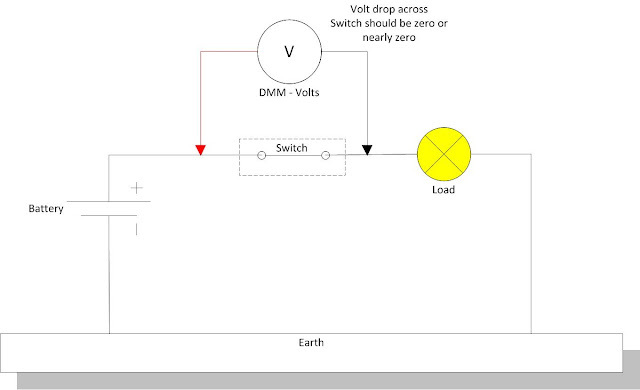 Note that most vehicle circuits will be earth return, hence one side of the voltmeter may often be connected to a convenient earth point when taking a reading. Another common, but perhaps underused technique when measuring voltage, that is particularly useful on vehicle circuits where voltage is low but current is high, is too measure the voltage ‘drop’ across part of the circuit. 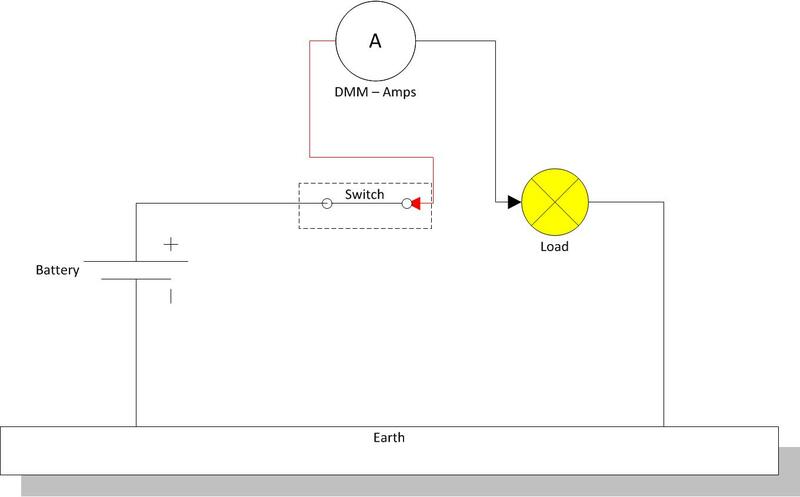 Particularly if a high resistance is suspected to be causing a problem – for example, across a switch or connector. 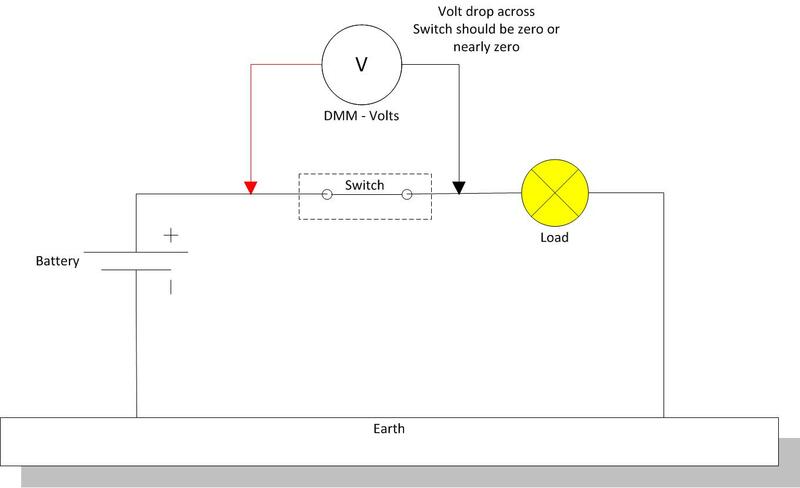 Measuring the voltage drop highlights a resistance in a working, loaded circuit and can easily show up bad connections, the diagram below shows the meter connection – a typical value is that the voltage drop should be no more than 10% on any part of the wiring circuit to the component. The important thing to remember is that the meter itself will have a limit to the amount of current it can measure, most DMM are limited to 10 amps maximum. So, you must be careful not to overload the meter circuit, which is often protected by a fuse inside the meter. Apart from voltage and current, it’s often useful to be able to measure the resistance of a circuit, or a component– that is, the restriction that the circuit/component provides to the flow of current. According to Ohms law, the resistance (in ohms) multiplied by the current (in amps) equals volts. So by knowing the current and voltage across a component, you can calculate its resistance (resistance equals volts divided by amps). However, it’s not always convenient to measure both voltage and current in a circuit (as you need 2 meters), also, you may want to establish resistance without powering up the circuit (for example, measuring a component out of the circuit). 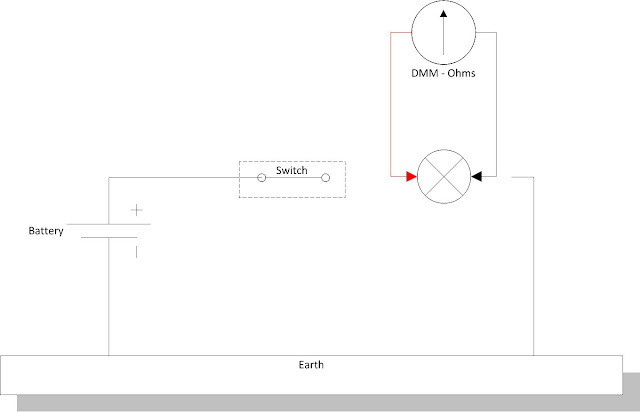 For this application, you can use an ohmmeter (ohms are the unit of resistance). An ohmmeter measures resistance by applying a small current through the component/circuit and establishing resistance by measuring voltage and current. The current is tiny, supplied by a dry cell battery inside the meter, so there is no anger of damage to the unit under test, also, it is removed from the circuit completely for the measurement so the circuit does not need to be activated. 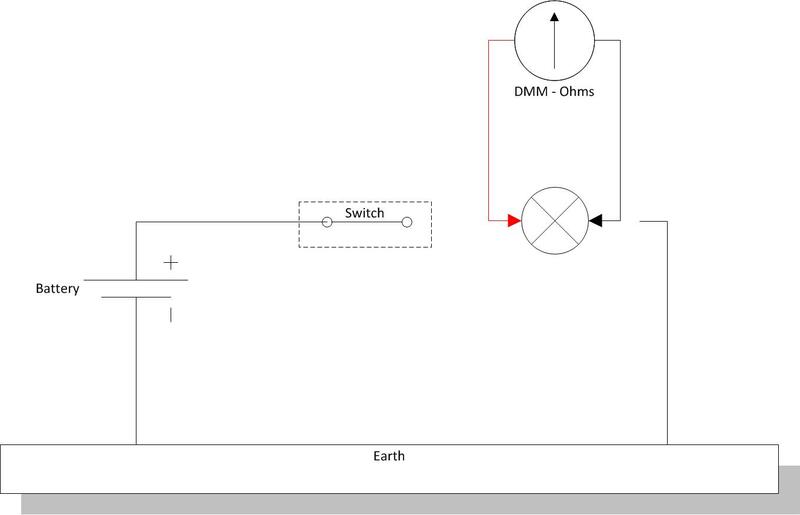 The circuit for measuring resistance is shown below and always involves complete removal of the component, or isolation of the circuit, in order to make a measurement. Very similar to a resistance test, often incorporating an audible signal to give a ‘go’ – ‘no go’ indication. Very useful for testing bulbs, fuses, switches etc. – components that are generally either open or closed circuit – this mode gives a quick indication if OK or not. The meter generally gives an audible signal (from a buzzer) if the resistance is below a certain value. Can also be used on wiring and connectors to detect open circuits, as long as the circuit is not live, and is isolated. Another type of resistance check but specifically for diodes (which are an electrical one way valve). They are semiconductor junctions and need a minimum voltage applied across them before they will ‘switch on’ and conduct. 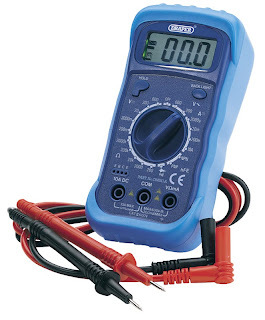 Most multi-meters will not provide this minimum voltage in resistance test mode, as they tend to use very low voltages to prevent circuit or component damage. In diode test mode, a small current is supplied by the meter. This is used to test the diode in forward and reverse direction (by reversing the lead connections manually). For a healthy diode, one way should conduct, the other should block. When the diode conducts, the voltage drop across the diode is shown on the display, generally about 0.5 -0.7 volts depending on the diode type. If the diode is blocking, no current flows and the display shows zero. This is an electronic component test feature, similar to diode test, but to test the gain factor of a transistor (i.e. the amplification ability of the transistor, also known as hfe). Unless you’re an electronics engineer or technician, you won’t need this. As above, specifically for testing the capacitance value of a capacitor – again, unless you are into electronics, you won’t need this! 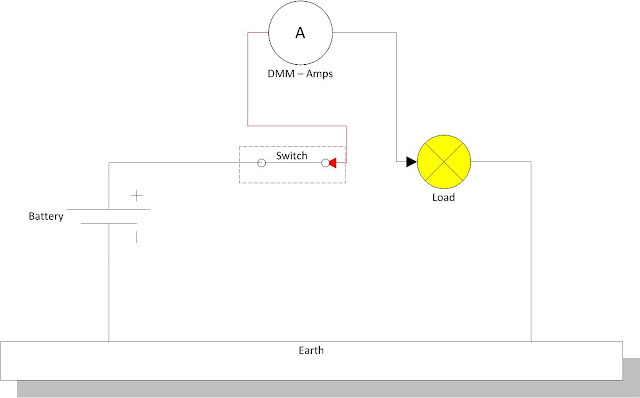 This mode allows measurement of engine speed via an inductive clamp generally supplied with the meter. The clamp picks up ignition pulses from the HT lead, the meter calculates the time difference between the pulses and converts this to engine speed. Sometimes the meter can be adjusted for 4 stroke or 2 stroke engines to give the correct reading, otherwise the reading has to be halved for a 2-stroke or wasted spark ignition system. Note that most multi-meters will measure AC (Alternating Current) and DC (Direct Current). For vehicle applications, you will be measuring DC almost exclusively! Make sure that when you are measuring that the meter is set correctly before you connect to the test point. Select the correct mode (AC volts, DC volts etc.). Some meters are ‘auto ranging’ so they are able to automatically detect the correct range according to the input. However, with some meters you have to select the range manually – be careful when doing this, if you are not sure what range you need, start at the highest and work your way down the scale! Make sure that you connect the test leads correctly for the mode you are in, there are normally several jack sockets, different ones for current and voltage. If you don’t get this right you will get no reading (best case) or worst case, you will damage the meter! Most digital multi-meters will read a maximum of 10 amps current, and most are fitted with an internal fuse so that if they are overloaded the fuse blows before any damage occurs to the cables or the meter. You’re now connected, so you can observe the reading, the display will show the voltage potential at the test point. The test point should show a voltage reading similar to battery volts. Before starting any voltage measurements, connect your meter across the vehicle battery, this shows that the meter is working, and that the battery is not flat! Note that in voltage range setting the resistance of the meter is ‘high’ so that it doesn't affect the circuit being tested by being a significant additional current path. A digital multi-meter is a useful piece of kit, particularly one with the useful extras for automotive use. However, you don’t need to spend a fortune, all meters will read volts, ohms and amps and those are the basic functions you need for electrical system fault finding. The most important things to look for are a good quality, durable unit with a protective case or holder that will stand up to the working environment. Long leads are essential for use around the vehicle (look for leads of approx. 1 metre), in addition to a large clear display (display back lighting is also useful).